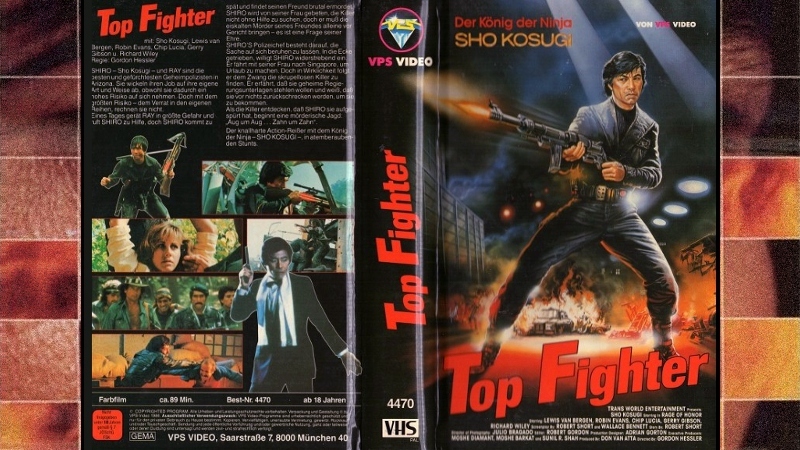 Despite his top billing in a series of martial arts films during the 1980s, Japanese star Sho Kosugi never achieved name recognition on the level of Chuck Norris, Steven Seagal, or Jean-Claude Van Damme (who he co-starred with in 1988's Black Eagle). 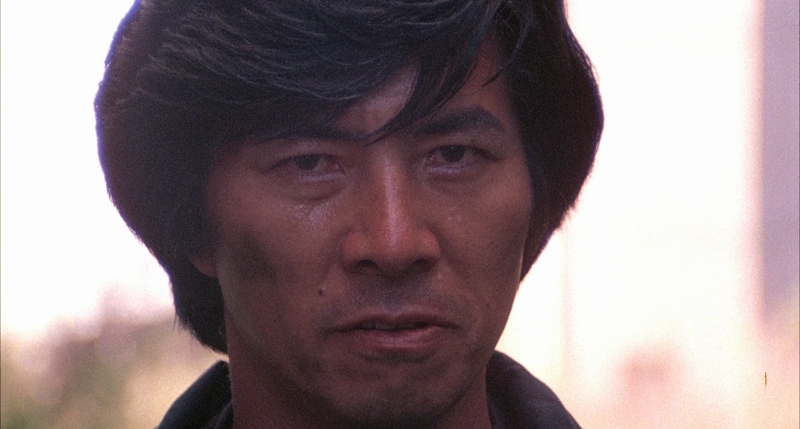 A year earlier, Kosugi completed the string of said films recently released on Blu-ray by Kino and Arrow: Enter the Ninja (1981), Revenge of the Ninja (1983), Pray for Death (1985), and today's subject, Rage of Honor (1987). Don't let the similar titles fool you: there's very little that ties these films together aside from their increasingly campy vibe, practical stunts, and colorful characters. Even within these limits, Rage of Honor sticks out for an atmosphere that aims for low-budget James Bond instead of traditional ninja fare. A financial gamble in the name of international appeal, this globetrotting action film feels compromised, flat, and sloppy from start to finish. Directed by the late Gordon Hessler (perhaps best known for The Golden Voyage of Sinbad), Rage of Honor stars the expressive Kosugi as narcotics agent Shiro Tanaka, whose partner has been brutally murdered by a ruthless drug lord. Vowing revenge in the most cliched way imaginable, Tanaka decides to go rogue and track down the killers in South America...but not before they kidnap his sweet and demure girlfriend, giving him two reasons to cut through a figurative mountain of bad guys and avenge whatever his partner's name was. People don't watch these movies for the plot, and that's a good thing: there isn't really much here beyond "red-blooded good vs. mustache-twirling evil", all done for the sake of maximum emotional manipulation and Saturday afternoon stress release. I really hate to use the phrases (a) "popcorn flick" or (b) "turn off your brain", but these are about the only applicable terms for any movie featuring a Japanese-American narc living in Phoenix who sadistically mows down bad guys on a hunch. If you're completely on board with (a) and (b), Rage of Honor offers a moderate level of enjoyment in the right mood. 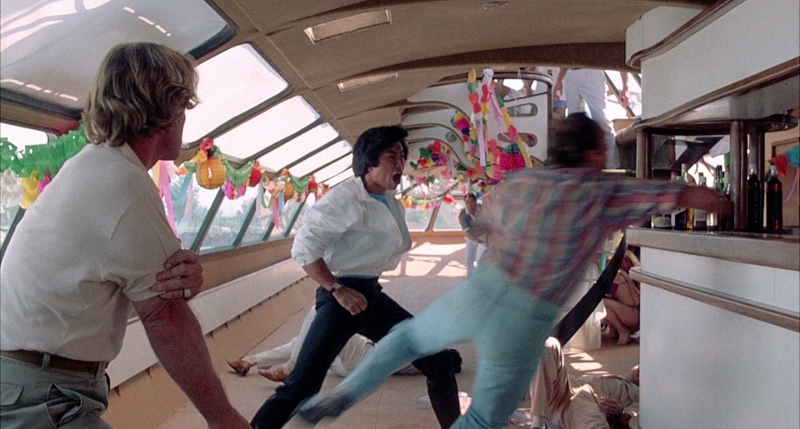 The fast-paced fight scenes and practical stunts are well done, the scenic South American locales mix things up a bit, and the cheesy synth-driven score manages to offer a few unlikely highlights. But it's obvious that Kosugi is out of his element here: whether fans wanted a James Bond-style thriller instead of another ninja movie, Kosugi just doesn't have enough natural charisma or...let's just say "vocal presence" for this kind of role. The film's 98-minute running time implies that Rage of Honor should be a brisk adventure with very little fat, but the bland supporting characters and ridiculous plot holes thwart the film's momentum between its short but plentiful brawls. If that weren't enough, Rage of Honor takes itself much too seriously every step of the way: you'll probably laugh at it, not with it. But whether you've got a soft spot for Kosugi's output during the 1980s or you're a martial arts fan with low standards, Arrow's Blu-ray of Rage of Honor at least offers a decent amount of support in the right places: featuring a solid A/V presentation (including the film's first widescreen transfer on home video) and a few short but decent extras, the only drawback here is that fans are barely getting two hours of total content for the rather high retail price. NOTE: This screener disc is not the final version. Any potential updates willl be posted in the near feature. I've been told that Rage of Honor was shot in "hard matte" widescreen and originally presented in 1.85:1, yet all prior home video releases have been cropped to 1.33:1. Luckily, Arrow's new Blu-ray preserves the film's original widescreen aspect ratio (with 2.35:1 opening and closing credits); though problems are evident on this 1080p transfer, I'd imagine that die-hard fans will be thrilled to have it in its original format (the wider framing definitely makes fight scenes more effective and easy to follow). Image detail and textures are strong overall, especially during the film's second half shot outdoors in Buenos Aires and Brazil. Indoor and night scenes fare much worse; noise and excessive grain can be more than a little distracting, though the slightly "burnt" color palette is relatively consistent from start to finish. No flagrant digital problems could be spotted, rounding out the visual presentation nicely. This is obviously the best that Rage of Honor has ever looked, but new fans should probably keep their expectations in check. DISCLAIMER: The resized screen captures and stills on this page are decorative and do not represent the title under review. There's much less to say about the audio. Presented in lossless PCM 2.0, it's balanced fairly well but leans much heavier on music cues than sound effects and dialogue; it's almost as if the music is stereo and everything else is split mono. This can be a little disorienting for new viewers, but it's always how Rage of Honor sounded to me so I assume this is intentional. A surround remix might have been interesting on some level, but I'll take the original mix any day of the week. Optional English subtitles are included during the film and one of the foreign-language extras. The simple interface uses Arrow's clean and concise template, featuring smooth navigation and full-screen highlights from the film itself. This one-disc release is housed in a clear keepcase with reversible cover artwork and a substantial Booklet with production notes, cast & crew info, technical specs, photos, and two brief essays about the film. As usual, a fantastic packaging job from Arrow that fans should enjoy. Several exclusive extras are here; the quality varies, but long-time fans should appreciate the effort. First up is "Sho & Tell, Part 2" (17:48), which continues the 2015 retrospective featurette started on Arrow's Pray for Death Blu-ray. As much as I dislike "collect 'em all" segments like this one, it's still worth a watch: star Sho Kosugi remains in good spirits and, though he struggles quite a bit with English and there are no optional subtitles, plenty of interesting details are covered here. Topics include general production info, shooting in Phoenix and South America, working with JCVD on Black Eagle, stunts and injuries, his training and diet regimen at age 67, the Wachowskis, and more. Two shorter and less specific interviews are also included here: Italian composer Stelvio Cipriani (2:46), who scored Rage of Honor, speaks briefly about his work with director Gordon Hessler but primarily mentions his music output during the mid-1970s. "American Ninjas" (1:34) is of even less consequence: this brief chat with writer Chris Poggiali (of Temple of Schlock) mentions Kosugi's films as part of the rise in ninja-themed films released in the US. Finally, we get a Trailer Gallery of Kosugi's films released by Arrow and Kino in the past year, including Enter the Ninja, Revenge of the Ninja, Pray for Death and, of course, Rage of Honor. These are in good-to-great condition, although the latter is presented in its more familiar 1.33:1 aspect ratio and looks much less impressive than the main feature. 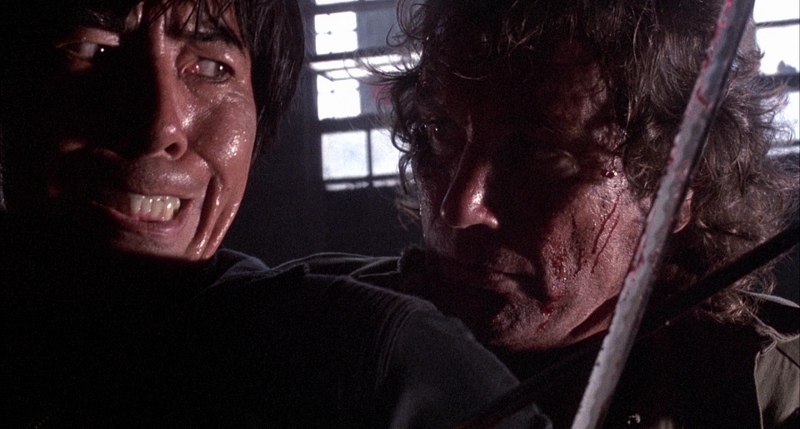 Rage of Honor is hardly Sho Kosugi at his best, as this 1987 film rarely plays to his particular strengths. The fights and locations are great, but everything else leaves a lot to be desired: even if you're a huge proponent of "so bad it's good", it's hard to get on board with the clunky dialogue, bad editing, and bottom-tier performances. At its best, Rage of Honor is little more than a side-step from 1985's Pray for Death, and it rarely achieves even those modest heights. Arrow's Blu-ray looks to be a welcome effort for fans of the film, though: featuring solid A/V quality (with perhaps its first widescreen presentation on home video to date) and a few slight but watchable extras, anyone looking to retire their MGM DVDs should consider this a safe bet. Everyone else should Rent It at the very most. Special thanks to our own Ian Jane for the screen captures used in this review!